Falling far short of a modern incarnation of Jimmy Stewart (a' la "Mr. Smith Goes to Washington"), Rand Paul Filibustered for 13 hours this past Wednesday. This was in an effort to get answers regarding targeted drone strikes against U.S. citizens - prior to a confirmation vote for John Brennan as CIA director. The Republican Senator from Kentucky finished far short of the American record (24 hours, 18 minutes by Senator Strom Thurman, R-SC in an attempt to block the "Civil Rights Act of 1957"). 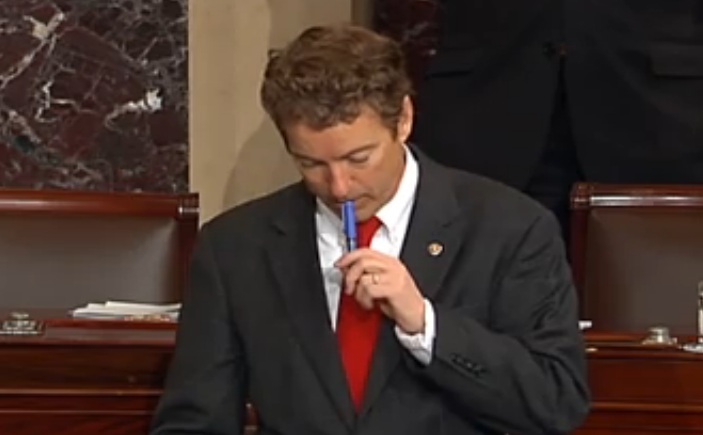 At the 0:59 mark in the above video, Paul puts the tip of his pen up to his mouth just as he says, "ahhh" (stalling) - and just prior to him saying, ".... We've called Justice also, I think, the answer says something about the sequester, maybe they're going to call me when the sequester's over ...". In this context, this body language signals an identical message to a finger, thumb or his whole hand to his mouth would have - for he is lying. No doubt Rand and/or his staff called the Justice Department, but he is lying here about the specific content of the response. This lie is of a rhetorical sort. It's not a whopper. Anyone with even a modest understanding of current (U.S.) politics knows it is deliberately theatrical. Thus this nonverbal is even more illustrative. The ability to tell a lie convincingly (verbally, nonverbally and via paralanguage), is proportional to the consequences of getting caught (Ekman). Since anyone with political nuance knows what's transpiring in this setting - the negative consequences of this melodrama is close to zero. Rand knows this. If he is not worried about being caught in a "white lie", and his body language still betrays his thoughts & emotions - then in the case of a bigger and more consequential deception, his subconscious would be sending up the nonverbal equivalent of the rockets' red glare to anyone who knows what signals to look for (there are many others). While the vast majority of people have never been trained in body language, when others put a hand, digit or finger-surrogate (here Paul's Pen) to the face - particularly the mouth, eye or ear - many are left with a feeling of "ill-at-ease". And they probably cannot tell you why - all the "right things" may have been said, but "something just doesn't feel right". Such nonverbals destroy rapport, lose voters, business deals and spouses.